In the outgoing 1960's and early 1970's more and more electronic components found their way into analog film cameras but it wasn't until 1976 when the first film camera with a built-in CPU appeared on the market. The Canon AE-1. By that time and shortly after the CCD found it's way into television and astronomy cameras. Sony was the first company to built and demonstrate a consumer-grade, filmless camera, the Mavica in 1981. An electronic still video camera. Work on the Mavica begun in 1979, maybe even earlier as Sony already had plans in 1974 for a Mavica device. That device was a Magnetic Video Card recorder. The recorder was never commercially realized but I believe that some ideas from that time were used to construct the Mavica of 1981. 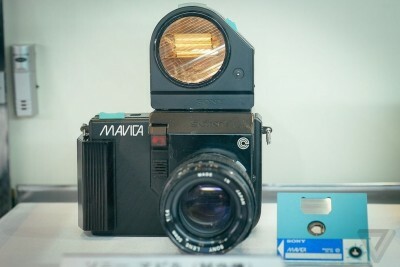 The term Mavica had now changed to Magnetic Video Camera. Sony also claimed right from the beginning that the quality of the CCD output didn't suffice and the camera would not be marketed for at least 18 to 24 months. Very realistic because a Mavica alone wouldn't do the trick. There were no standards defined yet. A special TV set, Mavipak player and even printer would also be required to enjoy the full experience. Also, Sony clearly stated that the Mavica was not intended to replace analog film cameras but should be regarded as a new way of home entertainment. The recording medium, called Mavipak, was a magnetic 2" floppy disk. Very similar to the 3.5" Floppy Computer Disks Sony introduced the very same year. As I said there were no standards in 1981. It wasn't until 1983 that over 40 manufacturers decided to standardize and promote Still Video Cameras and the Video Floppy Disk as ther recording medium. They were called the Electronic Still Camera Standardization Committee (ESCSC). That was that. From 1981 to 1986 it was a rollercoaster ride of hopes, dreams, promises, delays and prototypes. It was the new craze, the new hype. Strange enough, the market was flooded with peripheral devices such as player, recorders and printers even before Still Video Cameras were marketed. But why? It was not only the costs as mentioned, the technology was readily available. Videocameras with CCD's had already been marketed. It's basically the same as it was in the 1970's with CCD television cameras, recording and capturing moving images was easy but taking a still picture was the challenge! Sony and Canon were leading. Canon finally broke the barrier and launched the RC-701. First still video camera that could actually be bought. Kodak claimed from an early point on that they had all the material and knowledge to built a still video camera but never came farther than a prototype. From there on the entire still video market only lasted for six more years and the companies that opened the market, Sony and Canon, both closed it with the release of the last ProMavica (MVC-7000) and the last Canon RC models (RC-360, 560, 570). I don't know what the exact reason was why companies stopped producing still video cameras in 1992 since there were only a handful of digital cameras on the market and they were all very expensive at that time. Funny how we all exactly know how SVC started but know nothing about why it all ended so suddenly. Here is a quote by Kodak's former vice president Raymond H. DeMoulin which I found totally mind-boggling. It is from an interview he gave in early 1987.